John Logan (1826-1886) served in the Mexican War, the Illinois legislature, and was elected to the U.S. Congress in 1858. He also served in the army during the Civil War and contributed to the capture of Vicksburg. After leaving the army (Gen. Sherman recommended it to Lincoln), he founded the Grand Army of the Republic, an organization for Civil War veterans. He served three terms as U.S. Senator and was the moving force behind the creation of Decoration Day (now known as Memorial Day). An equestrian portrait of General John A. Logan rests atop a rectangular bronze base adorned with allegorical figures and reliefs depicting two scenes in Logan’s life. 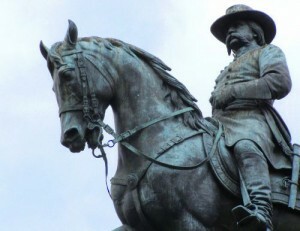 Logan, dressed in his Civil War uniform, is astride his horse with his proper left hand holding the reins and his proper right hand holding his sword pointed downward. Logan is depicted with collar-length hair and a long moustache. His uniform consists of a long belted jacket, boots, gloves and a hat. The horse is striding forward with its proper right front foot raised. The sculpture rests on top of a bronze base which is installed on a low stone base. At each corner of the bronze base is an American Eagle which symbolizes Patriotism. Palm leaves symbolizing Victory adorn the lower portion of the bronze base around the area inscribed with LOGAN. This entry was posted on Monday, May 28th, 2012 at 00:15	and is filed under . You can follow any responses to this entry through the RSS 2.0 feed. You can leave a response, or trackback from your own site.